Your hand goes out and there it is. I imagine it to be peaceful and restful. Even the 'urban' in your sketching looks semi- bucolic with the greenery all around. Me? Ha. Less urban sketching and urban warfare. Battling against my lack of perfect kit and the psychological warfare that goes on in my head. First, my watercolours. (And yes, there is a U in colour. Don't even try to tell me otherwise or I shall shoot you with my spray bottle. 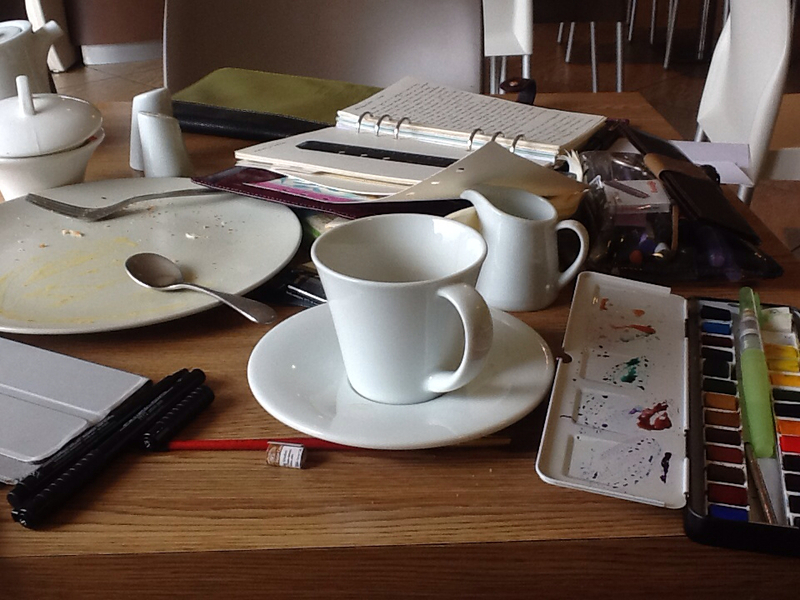 Or I would had I not left it at home, not having a perfectly organised sketching bag yet. ) I listened to your advice. Student paints will be trouble. Invest in artist quality ones. 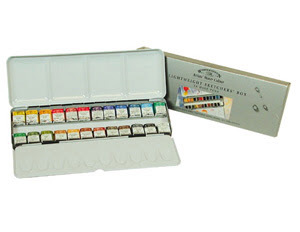 So I ordered this set of Windsor and Newton Artist quality half pans. It was not cheap. So I was a little foxed to find that if you unwrap the 24 half pans there is a ton of space left at the end of each line. So I budged them all up, added a white and an empty pan from an old Cotman student grade set and folded some paper up and stuffed it at the end of the row where there was still a gap but not enought of a gap for a half pan. Why would they make a 24 pan box that holds two rows of thirteen and a half half-pans? I got over that annoyance soon enought and made a paint chart. Watercolours in a pan don't always look like they come out on paper so a reference guide as to what was where in my box seemed like a plan. Would have worked a treat except, look what happens when you actually take your sketchers box out to sketch and open it up! What drongo designed this thing? I am not pleased. The saving grace is that the paint in the box costs a lot more if bought individually than in this piece of *$$%. Ahem. Sorry about that. Any recommendation for an empty pallette that will hold half pans in nice and snug? So anyway. The rest of the kit is a motley assortment of pens and water brushes in a pencil case and a Filofax. Currently an A5 Amazona. This is filled with proper Fabriano Artistico watercolour paper as recommendedby Ed from Mostly Drawing and I have so say that I like it. It takes watercolours without difficulty but still feels like paper not card. And the genius of the Filofax as sketchbook is (a) no wated time self binding books. Punch and go. Yeah! (b) No need to always carry a dedicated sketchbook. Slip a few pages of this paper into the A5s I use most often including my work ones so I always have paper. Then the kit can roll about the bottom of my handbag. So, that is adequate, although I can see how it could be improved upon. I am still struggling to use my kit though, mostly because I am inexpert and therefore hate the results. This weekend I went on two sketching opportunities. The first was to Cheetham Hill in Manchester where there is no semi-buccolic greenery. I actually went because wanted to take some more covert photos of people in the community for use in quilt work. Covert is not easy with a camera, especially when your skin and dress already make you stick out a mile. 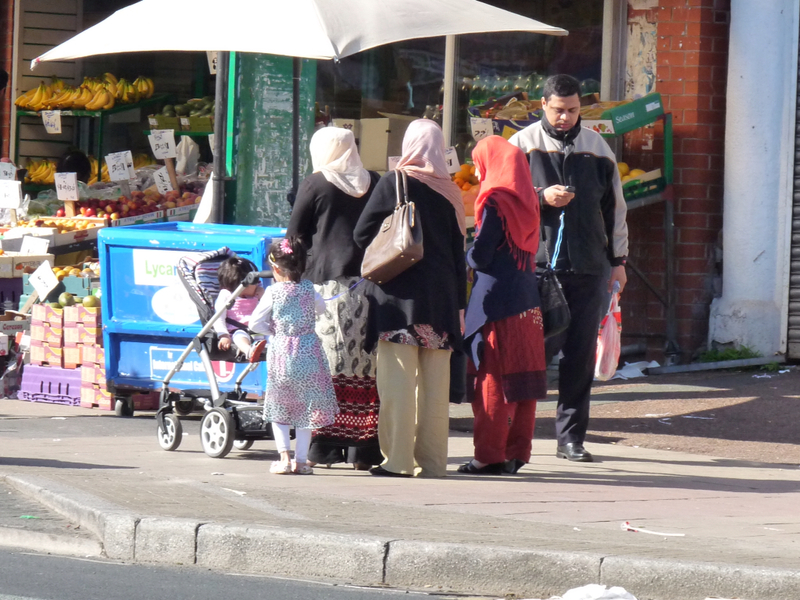 I was also mindful that the Asian communities are suffering increased attacks following the Woolwich murders and that they may be a bit twitchy about people photographing at the moment. So I first treated myself to a shop in the wonderful supermarkets which are remarkably cheap and stocked with exotic foods. I love to be in these shops. I thought a bag of guava jelly, arabic flat breads, paneer and spices might give me some legitimacy. Then, I sat in the sun on a low wall and looked across this road and attempted to sketch the shop. 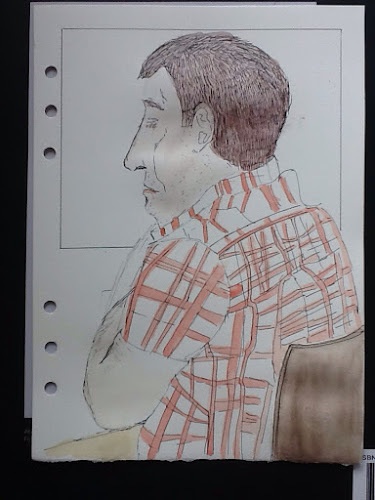 Then, whenever a saw a woman who caught my eye I would take some snaps, thinking that I could justify them as references for the sketching if anyone asked. "Trying to. I've only just started learning to sketch." He looked across at the shop. " Oh, you picked it for the colours and stuff? Show me when I come back." "It's a good start. In a couple of months you'll be really good." But isn't it funny how you seem to instinctively draw buildings and I much prefer people. Todays outting was to BocBoc where the staff tolerate me messing up their tables. This guy was enjoying his eggs on toast. You know how we have been talking privately about finding an artistic voice? Well, I feel that my people all look like I drew them and I can see myself improving so I am not unhappy with them even though I'd like to get better still. But my buildings and travel sketches look like they were drawn by a camel with a pen in its mouth. They make me very unhappy. So. I have decided to treat this sketching lark as if it were a compulsory college course. It is something I should learn and I accept, like Latin, it may benefit me in indirect ways later even if I don't make it my life's passion. I am open to being suprised and hooked by it and am willing to work at it and not give up so I can give myself a passing grade. Rather than messing about in ignorance I am going to educate myself. I will persevere until the end of the year and then I will review whether I will continue or not. I have ordered some books on basic techniques and have made a list of more advanced ones to progress through. I narrowed those down by only choosing the ones where the examples were in a style of watercolour that made me excited. (i.e not your average insipid country landscape). I did look at online courses but rejected them on cost/ unsuitable starting date/ really irritating voice and accent of instructor and the fact that watching a video makes me impatient and I tend to drift off and do something else. I prefer written instructions. Much quicker. In the process though I found many free online tutorials to work through and some short youtube clips. I am compiling a collection of journal page images to emulate. I have set out my objectives and goals so I am clear what it is I am trying to attain. And of course I wrote it all down on an assortment of nice paper in my wine zip Holborn Filofax which is just lovely to touch and makes me happy to use and which therefore offsets that useless paint box! And, I am adopting the attitude that there are artists who use watercolours in a way that gets me interested and inspired and that if they can do it then it can't be so hard that I cannot do it, if only I decide to learn how. 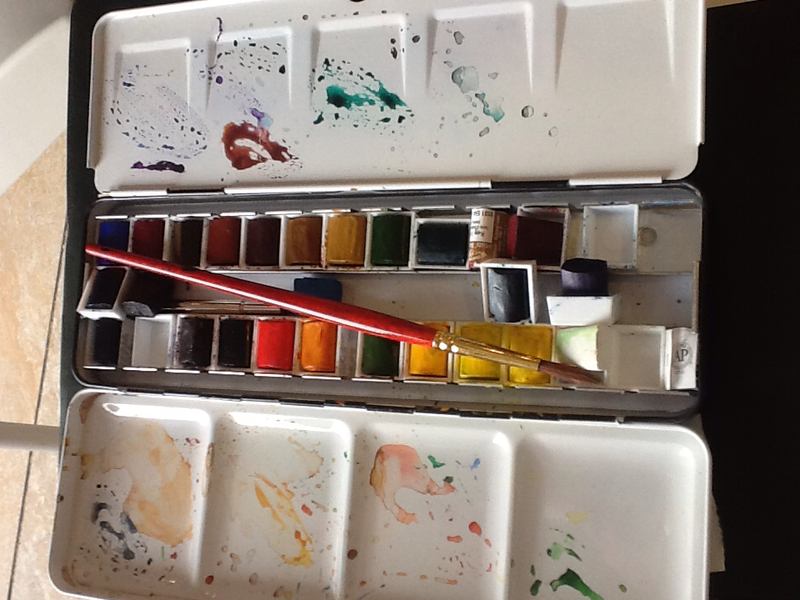 Then, when I feel I know what I am doing and what I use most I will address my kit again. The books should arrive at the weekend. In the meantime, I am off to scrape orange and yellow screen inks on to fabric for a wholecloth quilt background. That I know how to do! Update: Diane skyped me and taught me how to keep the paint in my box. It seems quite obvious now she has educated me! Helen, are you going to educate us too?